Why Dogs shouldn't watch TV! I have made another piece from Robin's designs, couldn't resist this one either. I added a flower and corner designs to mine and a couple of tiny eggs are hidden in the grass. I used over dyed and regular dmc in this piece and then antiqued it with walnut ink. Her blouse is a darker rose pink, looks a bit peachy on my screen. Sometimes I like to play with color and try new things, as you can see in this piece. I will be listing it on ebay later tonight. It may be my last piece for sale for awhile, I need to concentrate on Lynette's pieces for the upcoming show. And I will be working on some old patterns that people have requested and some new ones in the future. 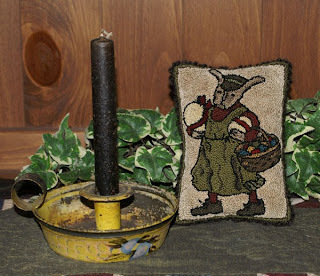 Check out Robin's new freebies and a wonderful new stitchery you can do for spring. 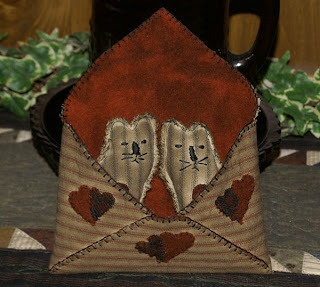 She has wonderful prim designs and great prices on her patterns. One of the wonderful things about blogging is you meet wonderful people. I really love reading your messages and opinions on my pieces. I also meet wonderful people while blog hopping. 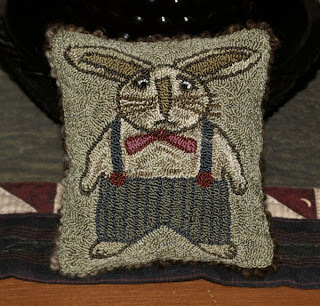 Since I have been doing cross stitches again, I have been visiting cross stitch sites. One of the wonderful people I have met is, Melissa from Words and Blooms. 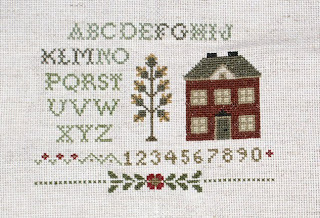 She does beautiful work on her pieces and I love her cross stitch wall. After leaving a comment she asked if I would like some of her older patterns and of course I said yes. I received a wonderful package with a cross stitch booklet, and two patterns. I decided to start with a piece from "A Sampling of Traditions," by Leisure arts. 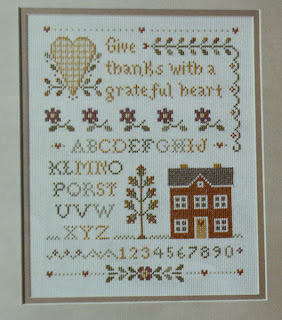 The piece I am doing is called The Grateful Heart Sampler. I love pieces with sayings, especially inspirational ones. 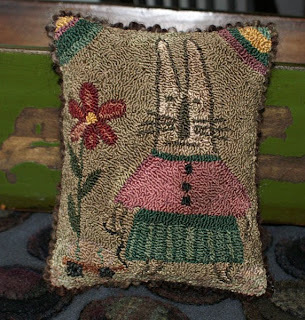 I plan on making a few, along withe some doll quilts to cover the walls in my entryway. This is what I have finished so far. Today I was not up to par, so I got more work done on it. It is a horrid picture and it does show were I make mistakes;) I am using two strands to give it an antique look. I am also changing a few things to suit my likes and changing some colors. The letters on the original are mixed colors, but I was going with one color. But, I picked up a strand without thinking and by the time I was on the third letter, I realized it, lol. So, I went with it and added two more in that color. Next time I need to take a photo, outside, without flash. It also called for 14 count and I am using 18 count, since i want smaller pieces on the walls. This is what it is supposed to look like;) I like prim colors, and the house looked more like a cottage, so I changed the roof. I found this old piece, that I was working on in the 80's and never finished. It has an alphabet going around it. I have no idea where the book is and if I still have it. Time to clean out the basement. I love comments and if you have questions, I always leave an answer in the comment section. This weekend, our group, USAPrim, had our monthly retreat. We pick a theme and then make items with that theme. This month the theme was kitties, so I made a few little cross stitch pieces. I made two of my stuffed kitties, they are fun to do and great for presents. I realized when I looked at the photo, that one kitty has a smirk like Dora and the other the aloof, cockeye look of Izzy. It was unintentional and the only reason that the one looks like Dora, is because I forgot the put the eyes on, so it made that funny face, lol. 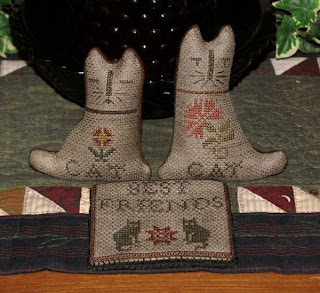 The Best Friends is a design by Betty, Primitive Bettys. She gave us the pattern so we could it for our kitty retreat. I made it into a little pin keep. I just love doing Robin's designs, they are so fun. This guy was no exception. As you can see, he is very sad, he has lost his eggs. I used variegated dmc linen for Buford, it really looks nice with just the right touches of dark and light shades. I used a variegated wool yarn for the edge, love how it changes from dark brown to light shades. Buford will be up for sale on ebay tomorrow. Next I will make the new rabbit that Robin has given as a freebie. I think the two would be great together, almost tempting to keep them;) Robin is very generous with her designs and she even has a Buford doll, that I am thinking of doing. For some reason the tags are not working for me tonight, so if you want to see Robin's designs, click on the link to the left. It is Bird in the hand Primitives. I was at it again. I drew up a little design, which looked nice with pen and colored ink. I tried the program I am testing and some of the design scanned in as a blob and some of it, was too light. I have no idea what I am doing wrong, so I decided to go with graph paper. Of course, what I draw with lines does not look the same on graph, so I have a lot to learn about making my own designs, to get them to look right. This is the end result. I tend to change things as I go, so a lot of it is freehand and then since I had no idea what size it was, I added a few things at the end. I wanted this to be put in a frame, but I think I will try again and this time, work out the pattern, before I start stitching. I made it into a pillow instead. I finished a new punch today. I loved doing this one, it is an adaptation from an antique postcard. I did it in prim style, but used 3 strands to outline it so it would have the look of the drawing of the original design. It will be on ebay later tonight. Last night, I wanted something simple and quick to do. I got a book from the library with a kitty done in aida. 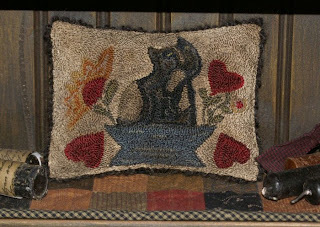 It was nice, but more on the cute side with flowers and stitched cat details. I decided to draw out a simple, small kitty and add a design to the front along with a face. I love how it came out, I think I will make more cats and other animals. Tonight Casey watched tv with me. First movie was a comedy, he just couldn't stop laughing. 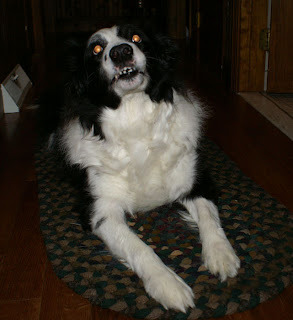 Maybe that wasn't a good idea, so we watched Cujo, a good dog movie. Well, maybe, not such a good idea. I found a free Block of the month and decided to do them for fun. It is nice to make something each month and then at the end of the year, I can put them together and have a nice gift to give for the holidays. 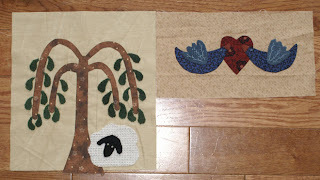 I might add some birds to the tree, it seems bare to me;) I am mixing fabrics and wool on this one, some pieces are just too small for me to turn under and I am lazy. 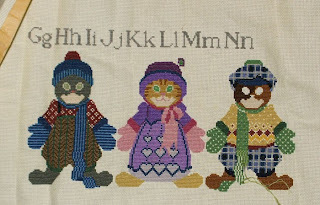 You can find the pattern, if you would like to do it, at Angie's bits n' pieces. The pattern can be found at the bottom of the page and is called, Simple Thymes. 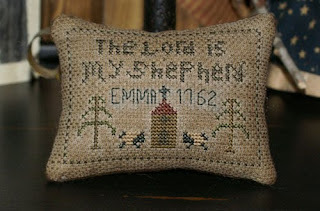 I wanted to make a cross stitch piece, something to put in a small frame, but no patterns. So, I made up my own and this is what I came up with. Now that I have done it and realized where I went wrong, I can make a larger version to frame with the whole saying on it. 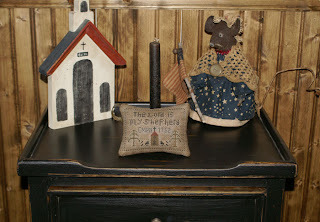 I think it looks nice on my new side table in my bedroom and my Betsy mouse that I won, looks wonderful in the grouping. Here is a closer look. I did this the old fashioned way, with graph paper and adjustments as I went. Not perfect, but not bad for my first try;) I have books coming in to the library, with colonial patterns, so I can improve on my designs for a new one, when I get them. I was too lazy to take pictures of the new blocks I made, so you are stuck seeing my obnoxious kitties, once again. 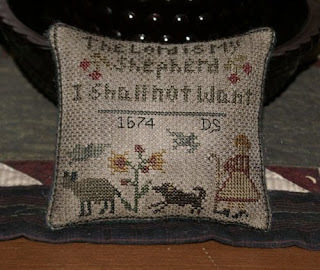 I also worked on a cross stitch piece for fun, mostly hand drawn, so I will take photos of those to show you, tomorrow. 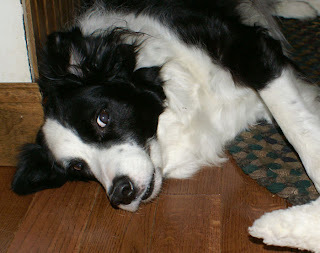 The other day I noticed some pillow cases on the floor and wondering how they got there. 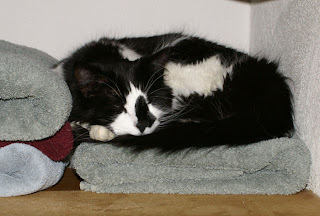 Then one night I was getting ready for bed and getting a washcloth and there was Dora on the top shelf with the sheets. 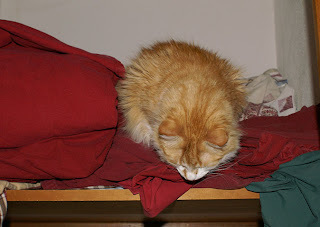 I love my kitties, but I do like my sheets, hair free and clean. 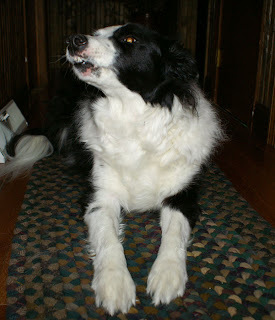 If I do not close doors tight enough, Dora opens them. I spend half my day closing doors, drawers and cabinets. 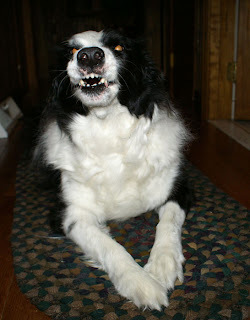 I guess someone didn't shut it tight enough and the next day, guess who I found copying her adopted sister. Izzy loves Dora and wants to do everything she does, but she does respect Dora's space and took the next shelf down. This is another wonderful design from Kelley's booklet; Sweet Friends and Flowers. 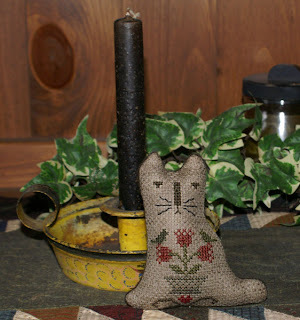 I used valdani for the kitty, I love their black along with some variegated linen and some of my over dyed floss. Her designs are so fun to do using various colors and types of floss, it really gives it a nice prim look. This piece is for sale on ebay if you are interested. This month we had a swap in our group, USAPRIM, which can be found on ebay and a friend of mine had a bday, and gifts were recevied, so I can show you some of the things I had been working on. 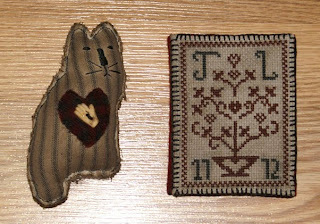 The kitty is a pin cushion that was in a book a friend gave me for my bday. Using the same cat, I made this piece for a friends bday. She loves kitties as much as I do. I made the envelope, by taking apart a real one and using that as a template. I made a few other things, but I guess I forgot to take pictures of them. Now that the gifts have arrived, I can show you what I was working on. My friend Kelley is turning .... tomorrow and I wanted to make her something special. 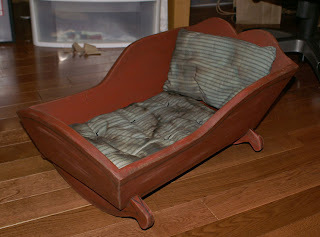 She had shown me an antique cradle that she would have liked to have. So, I had my husband build me one just like it and then I painted it to match the original. We had to work from scratch so the sides had to be redone and I didn't realize until I painted it, that he messed up the rockers, they should have a slight dip in the middle. I notice these things;) But, it all worked out and not bad for our first try. I made ticking pillows and then antiqued them. This is a photo without the matte spray. If you want to see a picture of it with the finish you can check out Kelley's blog, on the left side column. 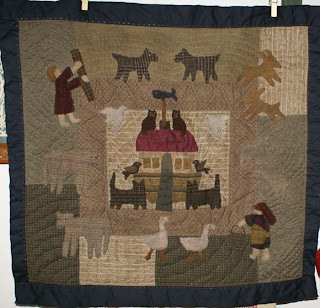 No cradle is complete without a doll quilt. I had planned on doing a hand pieced quilt, but then I got an idea and this is what I came up with. It is a combination of Janet Bolton, Jan Patek and Me. I belong to a wonderful quilt group and they have decided to do a signature block swap. Well, I decided not to join. Why? Because I cannot write, lol. I have the worst handwriting, my brain does not connect to my hand during writing, so I scribble. The girls were unrelenting and talked me into doing it with them, so I guess I am going to have to practice my penmanship skills, what little I have, that is. Today I decided to try out some pens and markers, I have, to see how they would wash up. I should have taken a picture before hand, but I did write the names of the pens, so you can see what ones show up, after a wash. 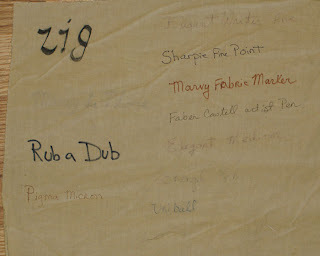 Some washed right out, as you can see from the blank spaces and ones like the rub a dub and the Zig writer, bled out a bit in the wash. It was a fun test though and I still think my faber castell artist's pen, writes the best and holds it's ink. I also did this on a piece of fabric with no backing, so it was harder to write. Someone mentioned using freezer paper to support it, while I write, so I will try that on a small block to get the hang of writing on fabric. Another project I am working on is, a crazy block. Every one is talking about making the new wool crazy blocks and I have always wanted to make one, so I made one up to practice on. Some stitches I can figure out, some make no sense. 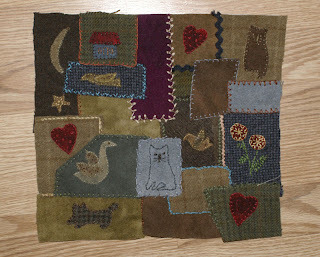 I added a few appliques and will do stitchery and maybe some words in the rest of the blocks. I might just bind it and use it as a hanging, way too much work to make a whole quilt like this;) Taking a picture with flash is tough with so many colors, came out way too bright.